CINCINNATI -- Newlyweds Joel and Sydney Meyer are living the traditional life they learned from their Cincinnati families. They’re high-school sweethearts (Elder, McAuley) and Ohio State graduates who lived with their parents until they were married this summer. But the place they're living now is off the traditional family chart. A month before their wedding in Hamilton and honeymoon in St. Lucia, the 23-year-olds signed a one-year lease for a one-bedroom luxury apartment in the newest complex in the city: the 292-unit Radius at the Banks . Two months into their marriage, the former suburbanites are living and loving the urban dream: unobstructed living room and bedroom views of the Cincinnati skyline; resort-style fitness center, swimming pool, club room and party deck; and dozens of restaurants and play space just a few steps away. The bonus of minding the “location, location, location” real estate adage is that Sydney doesn’t have to drive to work anymore. She walks south across the 150-year-old John A. Roebling Suspension Bridge every day to her job at the Metropolitan Club. When she returns to Radius, there’s more walking to be done. The Meyers’ fourth-floor apartment is on the far north and opposite side of the building entrance on West Freedom Way, and it has no view of the Ohio River and the Covington club where Sydney works. It’s just what she wanted. The couple had looked for a new apartment in Northside and considered a unit in Queen Tower in the Price Hill Incline District before viewing Radius at the Banks. Neither Joel nor Sydney regrets being perched over Fort Washington Way instead of Smale Riverfront Park. “It’s not as loud as we thought it would be,” Joel said. The Meyers’ apartment is a compact 800 square feet and is divided into three rooms that contain everything they need, including a washer-dryer closet and walk-through, organized closet that links the carpeted bedroom and tile-floored bathroom. The clever layout allows them to close off the bathroom to the closet when they have guests, who enter through a second door in the kitchen. The apartment’s main room comprises the kitchen, dining space, laundry closet and living room, where a 9-foot-wide window faces the PNC and Carew towers and the rest of the skyline. Like the dual-sink bathroom, the kitchen features dark chocolate-colored cabinets with brushed steel hardware and speckled cream granite surfaces. All the appliances, the kitchen sink and a coffee bar the Myers added to the end of the island are stainless steel. The backsplash is white subway tile, the lighting is a combination of track and pendants, and the flooring is a distressed laminate. The young couple worked hard to minimize the cost of furnishing their first place together. They bought an old dining table through Craigslist for $25, which Joel sanded, stained and finished. Its four chairs and a small end table cost them $120 at Bargains and Buyouts. Some of their artwork and decorations came from Hobby Lobby, Target and Macy’s, but wedding gifts, including a popcorn maker from Joel’s college buddies, fill out much of the house. Other than an early 20th-century highboy dresser tucked among the built-in organizer in the walk-in closet, the Meyers’ furnishings are modern, much like the building they chose to live in. They haven’t experienced all the extras Radius offers, which include a cyber cafe and yoga room, but they said they’re thinking about hosting a party in the club room to root on their beloved Ohio State when the Buckeyes face Michigan in football on Nov. 26. The U-shaped, $67 million apartment complex is at 44 W. Freedom Way next to the new GE building. It offers clear views of Covington to the south. City and riverfront views vary on the east and west sides. Some units have balconies and angled walls. 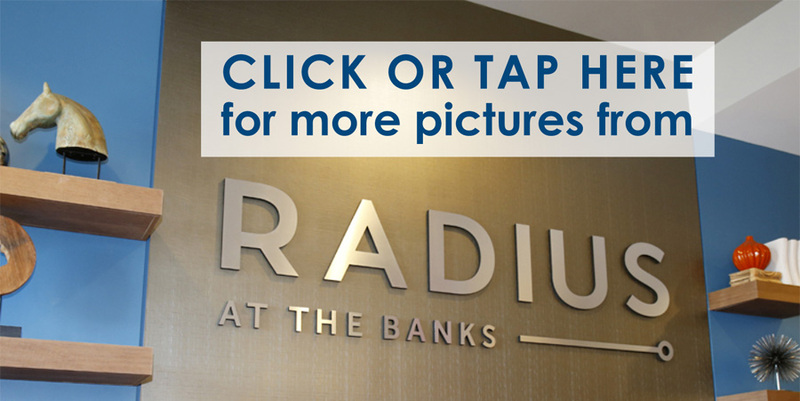 Radius was developed by Carter of Atlanta and is managed and leased by Bell Partners Inc. of Greensboro, N.C. Rent ranges from about $1,400 for a studio apartment to $2,400 for a two-bedroom, two-bathroom apartment. Pets are allowed for a fee. On-site parking costs $150 a month.